Reason #1: It’s engineered for your specific climate. James Hardie siding is built to withstand even the harshest weather conditions. Unlike vinyl that can crack in the cold, or wood that is easily affected by changes in moisture or humidity – James Hardie siding is constructed of their own fiber cement that resists warping, rotting, and weather damage. Whether it’s rain, hail, hurricanes, blizzards or UV Rays – your siding is created from the highest quality materials and requires very little maintenance. Reason #2: Your siding will be built to last. When choosing James Hardie siding and trim products, you can rest assured that your investment is well protected. Each product is backed by a 30-year, non-prorated warranty. In business for over 126 years, it’s no wonder that James Hardie is recognized as leaders in the industry. Featuring Color Plus Technology that resists fading, not only will your home be safe from any surprises from Mother Nature, but it will also look great for years to come. Reason #3: Your home will be safe on the inside and out. James Hardie is endorsed by firefighters nationwide and is non-combustible. Even when exposed to a direct flame, your new siding will not ignite. Unlike vinyl siding, which can melt even when exposed to strong UV rays, and wood siding, which serves as fuel for any fire – James Hardie products are widely recognized for withstanding the most unpredictable events of life. Because James Hardie siding is composed of fiber cement, pests such as termites, bees, critters or woodpeckers will not pose a threat to your home. 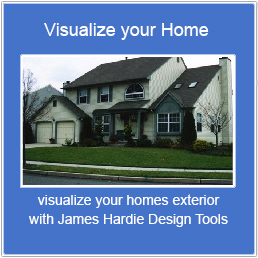 For a free quote on installing James Hardie siding on your Long Island home, contact Good Guys Contracting today. Our experts can walk you through the process, advise you on the best materials to choose for your home, and answer any questions you may have.